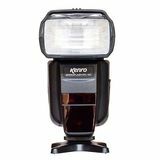 Kenro flash are available for canon and nikon fitting. The kenro KFL101 will fit both Nikon and canon cameras, which is absolutely perfect for professional studio phtographers who need an extra input of light, which ever piece of kit they choose to use. It simply slides onto the top of the hotshoe and then links through to the ususal camera settings via the contacts on the base of the shoe. Most flash head will function on AA batteries. Works for both nikon i ttl and canon e ttl.